Originally developed for sheet metal forming tools in the automotive industry, kirksite material is a zinc/aluminum alloy (94 percent Zn, 6 percent Al) with a melting point of 725 °F. Combining the cast kirksite tooling process with RP and CAD improves prototype, bridge-to-production and short-run parts injection molding. Modern developments in RP techniques made way for the elimination of time-consuming hand pattern-making and process streamlining-making cast kirksite tooling a superb tool for reducing time-to-market with minimal capital expenditure. In recent years, the injection molding of prototype, bridge-to production and short-run parts has become quick and cost-effective thanks to the marriage of the cast kirksite tooling process with RP and CAD technology. The designer's CAD file is used to produce a model by stereolithography (SL) within hours and with minimal human intervention. Casting kirksite cavities to net shape from SL master models translates the designer's intent directly into tooling that provides the perfect rapid tools for prototype and bridge-to production injection molded parts. Cast kirksite cavity set for two parts molded together with SLA masters. Originally developed for sheet metal forming tools in the automotive industry, kirksite material is a zinc/aluminum alloy (94 percent Zn, 6 percent Al) with a melting point of 725 °F. Due to the vapor pressure of the zinc, the material is almost immune to the gas porosity encountered with other alloy systems and the shrinkage is approximately half that of aluminum, resulting in great cast mold accuracy and repeatability. Kirksite is machinable and weldable, making on the fly design adjustments possible. One of the main benefits to this process is the ability to make geometric changes quickly and cheaply. In extreme cases, if required for the application, several iterations of kirksite tools are possible at less cost (in time and money) than one steel tool. Tool life is dependent on many factors, particularly geometric complexity and the nature of the material to be molded. Quantities of fifty to five hundred pieces are typical prototype runs, but quantities as high as two hundred thousand pieces have been molded using cast kirksite dies. Thermoplastic hand tool prototype with SLA master and cast kirksite cavity. The process for making cast kirksite tools begins by producing a master pattern with shrink adjustments, typically from a CAD file using the SL process. Joint boards are built to define parting lines and a rubber or urethane impression is taken from the master to create patterns for the core and cavity set. Then, a specially-formulated, plaster-base material is cast against the core and cavity patterns to create plaster molds into which the kirksite is cast. The use of plaster, which expands during setting, allows exact reproduction of even the finest pattern detail and finish. Once the kirksite is cast into the molds, the plaster is broken away. The molds are cleaned up and machined to fit into a standard mold base with ejection and runner systems or they can be used on a stand-alone basis. 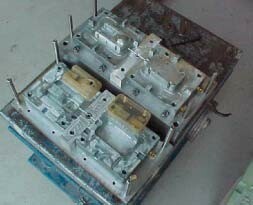 The molds are then mounted into a traditional injection press of the appropriate tonnage and parts are run. Any required heating or cooling systems can either be cast in place or added later by drilling. The molds are kept as simple as possible and built for speed, not necessarily efficiency. Hand-loaded loose pieces are used instead of mechanical pullbacks and slides. Four or five hand loads are not uncommon, although this slows cycle time and increases unit cost. Most of the design considerations used in creating injection molded parts are the same in prototype part design-including draft, fillets, radii and wall thickness. 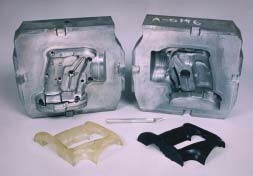 Parts run in cast kirksite molds generally range in size from a one-inch cube envelope to an approximate twenty-four-inch cube. Raw parts from cast kirksite mold set. Finished parts from cast kirksite mold set. As with any other tooling method, consideration must be given to process limitations to maximize the success of the product. By introducing a casting process into your tool build, you gain speed, but you must use a slightly wider tolerance band on non-critical dimensions since an additional shrinkage factor must be included. Areas that are critical to function must be identified and that detail can be CNC machined into the mold with great accuracy. Cosmetic appearance expectation must be measured and appearance-critical areas can be enhanced through mold finishing/polishing and appropriately engineered cooling and ejection systems. In most cases, parts will have an appearance very close to the production parts and many OEMs have used the parts to market their product ahead of full-scale production. Typically, companies have used prototypes for functionality testing in addition to product previews at industry tradeshows or in trade publications. Prototype hand-tool clam shell design. Many new hand tools or products you see on the Web or in a catalog have been made with prototype molds. Consumer products' companies with very sophisticated assembly lines are able to set up and fine-tune their lines long before an actual production unit is manufactured, enabling a seamless product launch. Companies with very low annual volumes also are able to use thermoplastic parts in their design by using cast kirksite molds for their entire production run. Many niche and high-end products have an annual quantity requirement insufficient to justify steel tooling. For intermediate quantities, steel inserts in localized high wear areas can enhance tool life at minimal cost. Duplicate core/cavity sets also are easily made from the master pattern for a cost-effective way to extend production capabilities. 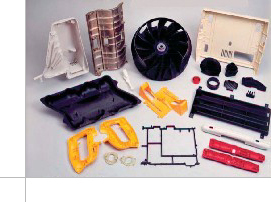 Parts can be molded in any thermoplastic resin while prototype parts in a range of shapes and sizes are routinely produced in two to five weeks. Part features that are not in the direction of draw are achieved with hand loads, which allow complex configurations. This technique is very useful to anyone developing new products with thermoplastic parts. Design teams can now get fully testable prototypes in a few weeks and begin the design refinement loop at a much earlier date. 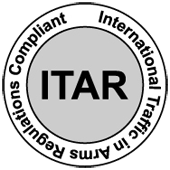 Manufacturers of consumer products are able to get UL and similar test approvals quickly-concurrent with test marketing and production tool builds. The process fits a definite niche in today's market and has been used in many industries to speed products into the marketplace. This is particularly true of consumer products whose designs are known for complex geometry and sophisticated styling. The nature of the casting process allows almost complete design freedom with no penalty in production time. All the detail in the original file is translated into a 3-D SL model and then traditional casting technology is used to transfer this detail to the injection mold. The technique has been used through a wide cross-section of today's leading products-including automobiles, hand tools, small appliances, computers, telecommunications equipment, medical diagnostic test equipment and audio/home entertainment gear. 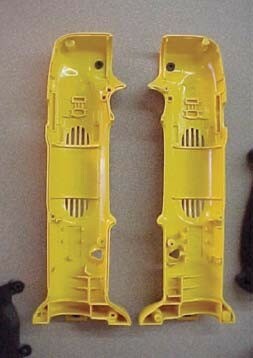 Cast kirksite tools also can be used as molds for many other plastic molding processes with similar success. When quantities make sense (i.e., short runs), cast kirksite tools have been used for blow molding, rotational molding, compression molding and RIM (reaction injection molding). The molds can be used for many shapes when quantity requirements cannot justify investing in machined aluminum or steel tooling.